What’s it like to have a deaf father? As Conan explains, it’s not so different—but it’s always interesting. Conan tells how his father, Henry Kisor, learned to read and speak, made his way through public schools, and grew up to be a newspaper editor and author. Conan also describes the challenges of lipreading and the technological advances that have made communication easier for his dad. 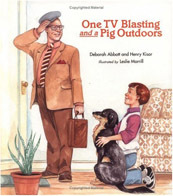 A retelling of What’s That Pig Outdoors? for children, it was co-written with Kisor’s wife, Deborah Abbott, an elementary school librarian and veteran children’s book critic. “Humorous happenings and mishaps show a man who views deafness not as a handicap, but a challenge, and lend immediacy to a topic that otherwise might not capture the interest of most children,” said School Library Journal.